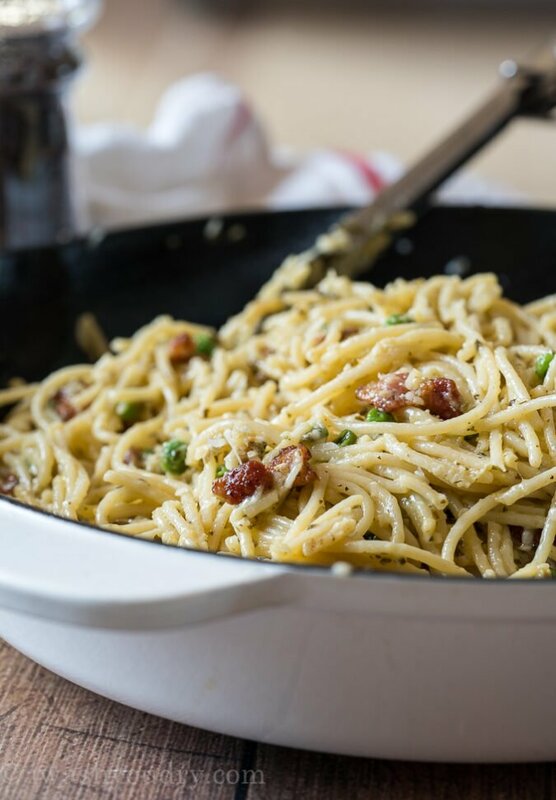 This Pesto Spaghetti Carbonara packs a flavorful punch with just 6 simple ingredients! Bonus- it’s ready in just 20 minutes! You’re not going to believe how quick this delicious dinner comes together! 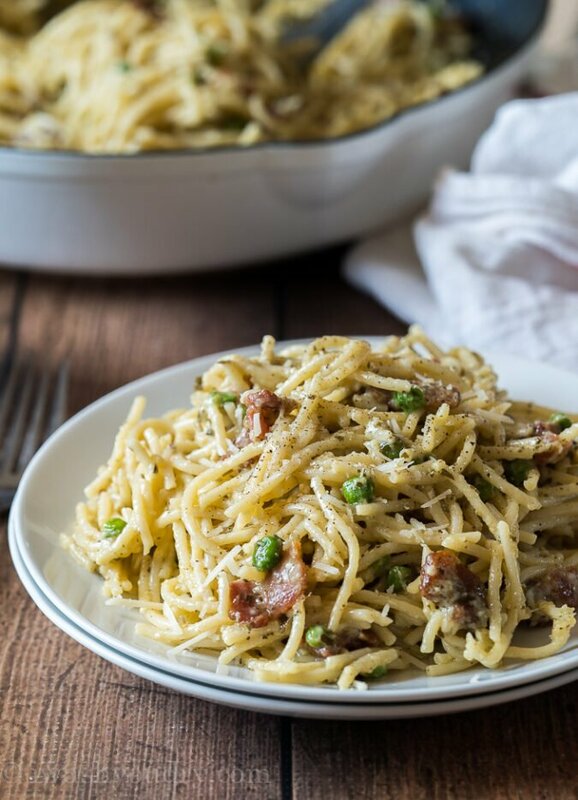 If you’ve never heard of carbonara, let me tell you all about it! Cook the spaghetti until tender. Drain and pour directly into the egg mixture. The eggs are cooked with the residual heat of the spaghetti noodles, creating a creamy delicious sauce that coats each noodle. 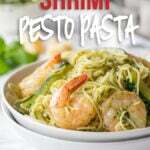 Pesto is a powerful secret ingredient in this quick and flavorful dish. It’s packed with basil, garlic, pine nuts and olive oil. I always have a jar of pesto sauce in my fridge ready to add to things like pizza, lasagna or pasta! 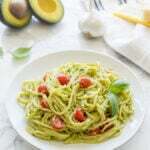 I have a simple recipe for homemade pesto if you have a bunch of fresh basil that you need to use up, but the pre made jar stuff will work perfectly for this dish too! While the pasta is cooking you’ll want to render about 4 slices of thick cut bacon. Once the bacon has browned toss in some frozen peas and cook until heated through. Toss in the coated pasta. Swirl it around in the bacon grease with the peas and crispy bacon bits. It’s heavenly. Top it with a little more parmesan, freshly cracked black pepper and serve it immediately. You’re going to fall head over heels in love with this super easy pasta dish! 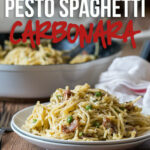 Pesto Spaghetti Carbonara is just 6 ingredients and an easy 20 minutes for a delicious meal. Cook noodles in salted water according to package instructions. 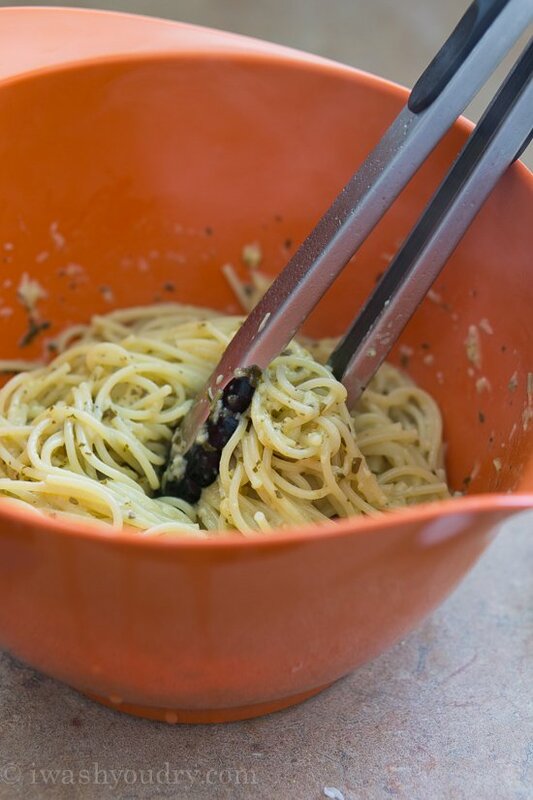 While pasta is cooking place the eggs, 3/4 cup of parmesan, and pesto in a large bowl and whisk until combined. Drain the pasta and reserve 1/2 cup of the liquid. Add the hot pasta to the bowl with the eggs and use tongs to stir and coat the pasta. Meanwhile render bacon in a skillet until browned. Add 1/2 cup of frozen peas (careful, they might splatter in the bacon grease), and cook until heated through (about 2 to 3 minutes). Carefully pour the hot pasta into the skillet with the bacon and stir to coat. Add as much of the cooking liquid as needed to reach desired consistency. Serve immediately, topped with additional parmesan cheese and season with freshly cracked black pepper to taste. Enjoy! I would eat a whole bowl of this. What a great recipe for weeknight. Thank you for sharing! 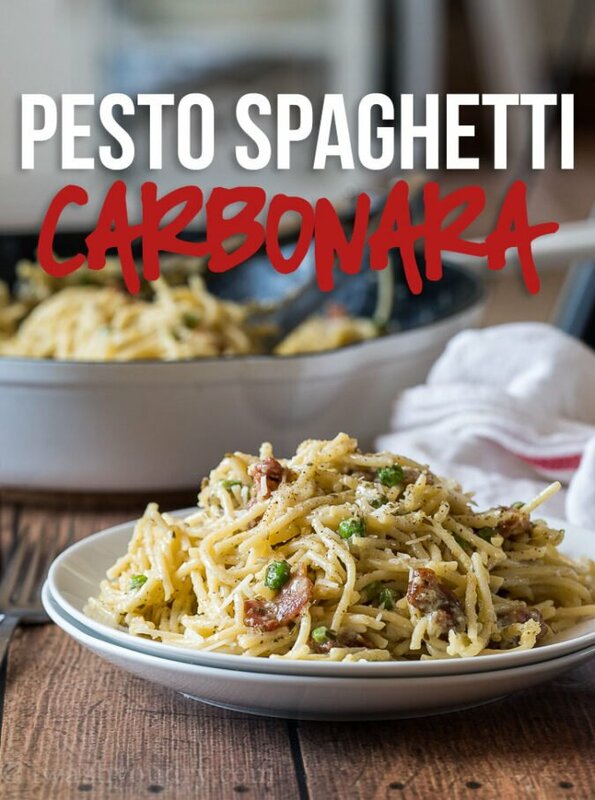 I cannot wait to make the pesto spaghetti carbonara. I made carbonara last night, but it didn’t look nearly as pretty as this! Haha, well you gotta try this recipe! It’s a breeze and always looks fantastic! 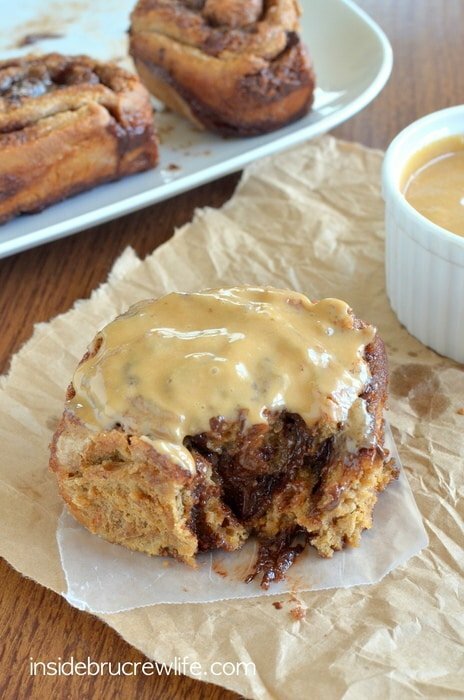 This look easy and yummy! But, I’m concerned about the two eggs being “uncooked”. Is anyone else? The heat from the pasta and tossing it in the pan with the bacon/pea mixture cooks the eggs. Made it several times with no issues. Great recipe! I added mushrooms! Sounds great with the mushrooms. Did you cook then with the bacon grease or just some olive oil? 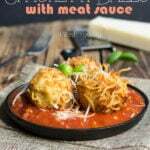 Awesome recipe super comfort food! The peas were sooo good in it. Sorry to hear about your grandfather! I just found your blog & I LOVE it! This recipe has intrigued me ever since I saw Rachael Ray say it was her hubby’s favorite lol..It looks SO good & easy! My little brother loves bacon, but wouldn’t be able to eat it b/c he is allergic to eggs that aren’t cooked thoroughly & he’s allergic to sweet peas lol..but I could leave the peas out & maybe just keep the finished product on the heat a little longer so the egg won’t be undercooked if that makes sense lol-His allergies are odd! I cook for him and another brother alot & I’m always wanting to try new recipes..thanks for the post & I look forward to visiting your blog more often! My kind of dinner right here! Looks awesome! I am sorry about your Grandpa. I bet your husband appreciates you even MORE. You are right this is mighty tasty dish. I realize as I am typing this that I haven’t had it in years. What is MY problem. Thanx for the push. LOVE this recipe! I’m a pesto & pasta freak. Sorry about your grandfather. I know your hubby is glad you’re home! Gotta love Pesto–it’s the perfect ace up the sleeve!